The problem is, what vehicle should we get? I know there are 9-seat SUVs, but we wanted something with growing room, and no gimmicks like mounting a bench in the cargo area. GREAT for church to haul adults. For Moms with kids in car seats? Not so much. Most moms of large families agree that option a. is a step down from having a minivan, and that if there were something better on the market, they would not choose to drive these livery vans meant to quickly haul a lot of workers to a job site, not for allowing moms of many to ride in style, with relative safety and comfort. There really are no redeeming qualities beyond this being the most common and affordable option. Some of the downsides are: bad fuel economy (10-12 mpg), poor safety ratings, no headrests (whiplash, anyone? ), no cargo space, loud engines (can't hear back rows), very few "creature comfort" features, no sliding doors (kids throw the barn doors into vehicles parked next to them), ancient design going back decades, seat belts that mount to the sides of the van instead of to the seats (creating a seat-belt maze for those trying to get into the back). Most people who drive these vans do so only because this is pretty much the only option. Personally, these vans scare me. They may be great for adults who can get in and out of the vehicle by themselves, but I would hate to have to evacuate little kids stuck in car seats out of this one if there were ever a need to. 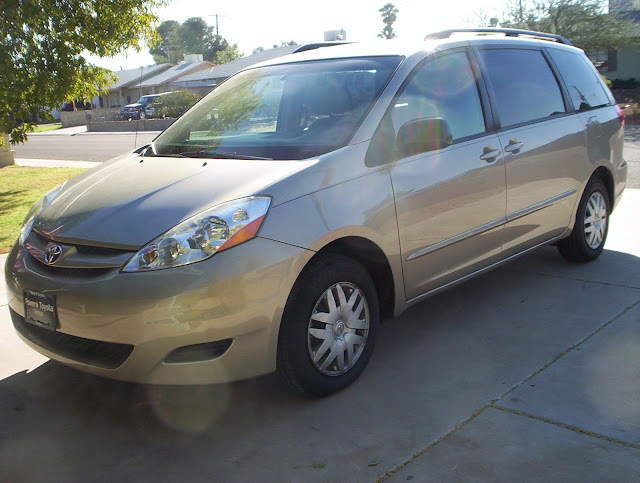 Plus, the whole thing just screams "work van", and has few of the amenities I am used to from my Sienna. Option b, the Mercedes Sprinter, is out of most families' budget (ours included). Other downsides are: parts and repairs are very costly, there are not many "creature comfort" features for it being a Mercedes (though more than option a), and this is truly a behemoth of a vehicle that everyone notices when you pull up. Positives: it has the best gas mileage of all full-size vans, by far the most cargo space (100+ cubic feet more than the next best option), handles very easily (small turning radius, etc), gets fantastic gas mileage (20-22 mpg), has a powerful engine, and is available in walking-height interior. Personally, this has been my vehicle of choice ever since being forced to think about future van options. The price, however, is foreboding. I figured that if and when the time came to move up, we either would buy this if the money was there (probably not), or go with option a. if it wasn't (most likely). In my mind, I had let the van issue rest at that, enjoying my Sienna as long as I still could, until I saw an ad in a magazine today for a van I didn't even know existed. Indeed, this is a NEW option! Option c: the Nissan NV 12-passenger van. It just came on the market March of this year. It's like a pickup truck in the front, and a long SUV in the back. The price is much more reasonable than the Sprinter, about 35k out the door. This one is biggest on the "creature comfort" factor of all the options - pretty much like a big SUV. Gas mileage is better than option a, but less than option b, about 15-18 mpg in town. The biggest downside is the cargo space - it's only about as deep as the typical minivan, though a bit wider. Unlike option a, it does fit a double stroller. Also, all back seats can be taken out individually, as opposed to there being benches. So for long trips, part of the back row can be eliminated to make more space (with a bench, taking the whole row out would eliminate four seats, not just one or two). In all, there are supposedly 324 different possible seat configuration, including having the second row facing the third row. Plus, it can haul up to 8700 lbs with the trailer hitch, and most large families needing 12 seats have to haul their stuff separately for long trips anyway (unless they drive a bus). Also, this one has a sliding door, not a barn door, meaning kids won't be denting the cars in the adjoining parking spots. There are curtain airbags all around, giving it better safety ratings than option a (makes for cheaper insurance, too). Seat belts mount to each seat, so no maze. Most commonly repeated downside: the looks. Some say it looks ugly or too boxy (like the Cube), making it more of a "man van" than your typical minivan. I don't think it's bad at all. Or, we could start riding around in a converted school bus - doesn't this look super cool?? Do any of you have suggestions you could share on this topic? Maybe you even own one of the vehicles mentioned above? Any additional insight? See, this stuff keeps me up at night, literally. How to haul a family the size of horse-and-buggy days, when we don't live in horse-and-buggy days any more. Nowadays, it's all about the cupholders! anon, I have seen some of the big vans with bucket seats, but it's very rare. Those are nice. Heather, just this morning, I was thinking: "I wonder what Heather is driving, I should ask her" Until yesterday, I had no idea it existed. If you look in this month's issue of Family Fun, there is an ad for it just inside the front cover. I'm seriously thinking about going by the dealer this morning to see it for myself. This van issue has been such a burden on my mind, as all available options seemed like a bad choice. This looks so promising!! Oooh that Nissan looks great! I still have a couple of children to fit until we reach capacity on our van but lately I have been looking on the public surplus site and our state surplus site for great auctions on bigger vehicles and little commercial shuttle buses..also there is a lot of other stuff you might be interested in like school furniture..there is even an auction in my state right now for like 450 library books for $20. I have seen school buses go for 1K, seems like a fun project to work on together to convert! We were in your boat (or van, LOL) 4 years ago. We had an 8 passenger van that we loved and were not thrilled about the maxi van option. We did eventually buy a 12 passenger Ford van that I now LOVE. It is a 2007 and it is actually VERY comfortable, there is plenty of room, and it is great to take on long trips. It also pulls like truck, so you can get a camper for family vacation. Basically, I am trying to encourage you that the 12passenger van is not as horrid as I thought. We just had our8th 3 weeks ago and it was great to have enough room for him. We have a Ford 12-Passenger. The nice thing is that you can find them for a real affordable price. We got one with 80 thousand miles and only paid $3,200. It is in real great shape. The down side is the gas and loading babies!!! I know.....buy a used school bus!!!!! Dodge makes a Sprinter too. Might be cheaper than Mercedes. anon, congrats on your new addition! Whatever van we end up with I will be happy to drive, trusting that if that's what God provided, that's the best option for us. The Nissan can pull up to 8700 lbs with the hitch option, I really do like the idea of that. Jessica, yeah, the price on those vans definitely can't be beat! Do you have your back row out, or what do you do for cargo? anon, since 2007, Sprinters have been manufactured by Mercedes, not Dodge. There are still Dodge versions on the road, but from what I have read and heard it can be a real pain trying to find replacement parts for them now. With #6 on the way, we're about to outgrow our van too. We've been looking at the Sienna or Odyssey. How's the leg room in the back? My oldest is 6'2", and not done growing! The Odyssey's leg room is nowhere near big enough, so I'm hoping the Sienna will be better. Had to come back and find out what everyone was sayin!!! Sometimes we do have the back seat out. For big grocery trips we have it out. Most the time we do not need to though. Hope you find "the car of your dreams" quick!!! Then, pack up and head over here!!!!! :) :) Oh how I wish we could convince Pastor A that Idaho neeeeeeeeeds him!!!!!! But, I know he will stay in AZ til death does he part!!!!!!!!!!!!!!! Miss you guys and talk of our trip there so much!!!! Remember our game we played? HAHAHAHAHA!!!!!!!!!!!!!!!! Right now we just have to take two vehicles everywhere- definitely not ideal! But other than church we really don't all go out at once very often. I can squeeze all the kids in the minivan if I need to, but there's no way we can get my husband in there too! Oh, oh, oh! I have a friend that has the Nissan van! I've ridden in it and it's nice. It doesn't have alot of luxury features but it's not as utilitarian as the cargo vans. I think she might have the back row out because she has a huge amount of cargo room. They have 4 children right now so they don't need the seats yet. I'll send her your link and hopefully she'll chime in with my details. Hi There! A friend of mine forwarded this blog to me since we are one of the first families EVER to purchase the Nissan passenger van. We bought it as soon as it came on the market in March. We have four children with prayerfully more on the way. We do 4-h and need to haul lots of stuff to dog shows plus a double stroller and for overnight trips, two pack and play cribs. We sold our GMC Denali for the Nissan van. I'll start by saying that I was really sad about giving up some of my luxuries from the Denali but my van is so usable for my growing family that I don't miss my old "bells and whistles" at all anymore! When we bought the van no dealer in the whole country had a model with leather seats and since we were down to sharing our four door pickup truck and baby number four was due in a couple months we opted to go ahead and buy the van despite not having the leather. We got all the other package upgrades though. I'll add that the v8 engine is a must as well as the technology package which includes the backup camera. It's a mighty big car so there are lots of blind spots and you really can't see out the rear windows at all. The camera is a must for safety. It drives great! It feels the same as my SUV and doesn't have that top heavy feeling that the Mercedes has. I thought I was going to roll that thing over! There is tons of head space. If you need to have all of the seats in you do loose trunk space but the height of the vehicle makes it possible to stack things so you can still get a lot in there. Also it has a very wide side isle that you can store things along if need be. This is truly a functional but comfortable vehicle and way better to drive and ride in than a clunky old passenger bus. Every seat has head rests, the seatbelts are integrated which is safer and much more convenient. We were one of the first people to give feed back to Nissan on the van and told them how they needed to market it to large families. They were initially thinking of upscale hotels and businesses but when we told them why we were buying it and who are friends were ( other large families) they rethought their marketing strategy! They will be adding even more features as time goes by and I can see us trading in the one we own now for a newer version when they start sending them out. The gas mileage is about 18 miles to the gallon. Not fantastic but better than some and really about the same as we were getting with our SUV. The cost is very fair considering what you're getting and even with all the packages it is under 40,000. I love my Nissan passenger van! anon, the leg room in the back of the Sienna is fine by my standards, but I'm only 6'5'. The middle row can slide back and forward considerably, creating more room for those who need it. You should definitely try it out for yourself, though. Jessica, I SOOO badly want to come visit! If your offer still stands when we get a new vehicle, I will definitely take you up on it! I even have a new board game to bring along and play, but I'm not telling what it is. Heather, I totally hear you. I'm not one to care about cars, but we both know how much time we will be spending in these things, so little details make all the difference. Kerri, thank you so much for pointing your friend my way! mamax3, THANK YOU so much for your input!!!! Now if you could just drive on over to AZ so I can test drive your van... :) Seriously, I called every Nissan dealer in Phoenix, and none of them have the van in stock. I can custom order one, and it would take about 60 days to get it. The last one that a dealer had in stock, was off the lot in less than 30 minutes. Everyone I called said there is a huge demand for these vans, but the company has been slow to produce them b/c of some part they cannot get in stock fast enough. IMO, there is one major change they need to make: add a sliding door on the driver side! I really feel that large families will become their biggest audience for this van. With an infant seat in the back row, a door on either side is a MUST. Or else Mom has to clim across all seats to put the infant seat in, or else cut the seats in the rest of the second row off from being used. Obviously there would be no aisle on the driver side to get into the back rows, but my Sienna doesn't have that, either. The way our seats are set up, the back row can only be accessed from the passenger side. Power doors would be another great addition, as would be a standard V8 motor and factory hitch. I am going to email the company right away, maybe they will get enough feedback to eventually implement the changes (though likely not by the time we would need to buy). Thank you so much again for your time in giving us all this great feedback! I'm reading you blog and all comments with interest. :) We had our 3rd child this summer and are thinking about moving up from a car to a bigger vehicle. I so badly wanted a Toyota Sienna, because the Toyota Camry I've been driving for the past 8 years has been very dependable. But my husband hates vans and wants a Ford Flex. I come from a large family and we had 12 passenger and 15 passenger vans. My mom always put the baby seat in the center of the front bench seat but I don't remember where the other carseats were. Zsuzsanna, I love your blog, but one line has me quite concerned. You said "Which is okay because we usually only drive around town, so on the rare occasions that my husband is coming along, he can take his own car, or we put four kids on the back row bench (one car seat, plus three kids sharing the rest of the bench)." I'm not sure if you are aware but the majority of car accidents occur close to home. Several different studies have found that between 50 and 77% of accidents happen close to home. One study conducted by Progressive Insurance of 11,000 of its car insurance policy holders who had reported an accident in 2001 found that 77 percent of the survey participants indicated they were within 15 miles of their home when they had their accident! In fact, it was discovered that accidents were two times more likely to happen when drivers were 1 mile from their home compared to 20 miles. Please make sure all of your children are properly belted in. I would hate to see one of your precious children injured (or worse) in an accident. In this day and age there is no reason for you not to have all of your little ones properly buckled. I understand if you don't want to post this because of the dancing, etc. but my husband and I drive the Toyota Sienna and laugh at this video each time we see it. When our teenagers balked at driving a mini van (yuck!) we'd say "But it's a swagger wagon....cause we're hip." I discovered the Nissan NV several months ago. I have to wipe drool from my lip when I see one. I fell in love instantly. That's me. We were in the same situation as you in 2001, and we are on our 2nd Chevy Express 15 passenger van. We usually drove it without the 4th row seat, so there was lots of room for strollers, groceries, bookbags, etc. Our current van is a 2009 model. If you can afford to do it, I recommend keeping the Sienna as an extra vehicle. If you aren't taking the whole family, the Sienna can be used, saving you money on fuel. I purchased a Sienna to use for work, but it was also a great 2nd vehicle that got 22-24 mpg that we use often instead of the Express when possible. I looked at the Mercedes, and the cost was prohibitive. Not only the initial purchase, but maintenance costs are often triple what you would normally pay, and Mercedes aren't as reliable ad you might think. The Nissan is exciting, and if we only needed 12 seats would likely be my choice. However, we often need all 15 seats, so it isn't a good option for us. So that leaves Ford and Chevy. Fords have nicer interiors, but I like the Chevy better because it has a longer wheelbase and is more stable when loaded. The longer wheelbase is not offered by Ford. There is also the political aspect- I probably would not buy a new Chevy just to protest the GM bailout. Thanks for the link love! We definitely do adore our NV and recommend it to others. In fact, our dealer adores US because he's sold so many from our recommendation! I read someone else's comment on the v8 and I thought I'd throw in my two cents: we debated that pretty strongly but I can assure you that the v6 actually as plenty of power. Yea, you're gonna "hear" it more when you put the pedal down, but it goes when I need it to. And our gas mileage is better because of it. You're going to get about 17 mpg with the V6, I think. Which did you get? And how do you like it? I was so glad to find this site and read everyone's opinion on the van issue for large families. We are expecting our 7th in a few weeks, and haven't decided what to do about the car situation. We currently have an 8 passenger Toyota Sienna, and my husband drives a Honda Fit. I am leaning toward the Nissan NV, which we have test driven and really liked, but my husband would like to save the money and take both cars when we have to go anywhere together. I feel like my three kids that are in the back of our Sienna are rather squashed (especially the one who sits in the middle, since the other two are in car seats). I also agree that a sliding door on the driver's side would be fantastic. We discovered on the test drive that car seats block all the other seats in the row, so the car seats have to go against the far side, or you can't use the other seats in the row. This is a big drawback when you have multiple car seats. we love our sprinter van (we have six children). it's easy to drive, great for road trips, and super practical. worth every penny. My wife and I are considering the NVP3500 probably in the SV or SL model, I really like the looks and the fact that it has so much room. Funny thing, our children are grown and we are considering it for our retirement years. Trips to Florida (snowbirds) and trips around the country. We would take out all of the seats except the driver and passenger. My main concern that has held this decision up is the fact that the Nissan Titan has a really bad safety rating and since this vehicle is based on the Titan......well I'm not sold on the safety aspect of it. I do realize that it has the curtain airbags, but just reading about the non-safety issues with the Titan keeps scaring me off. Anyway.....God Bless everyone! ps....the NVP3500 will not ever have a safety rating since it is considered a Commercial Van. We have the Nissan van 2014 and it DOES NOT get 18 miles to the gallon. We average about 13. The sales people told us 18 miles to the gallon. It's just not the case. It had me second guess our purchase this year when I have 4 kids at 3 different schools. I just filled it up two days ago and is already almost down to a half of a tank, I've only gone 140 miles. But I don't know if there are any better options out there for that big of a vehicle. We have the Excursion Diesel and tow a 30 foot trailer with all 9 of us in the vehicle (aftermarket approved rear seats for littlest ones). The torque pulling capacity of the 6.0 Diesel is AMAZING. We owned the V10 gas Excursion before. Despite itself being a powerhouse for lighter towing the difference between the diesel and gas is night and day (not unreasonable to pull a fully loaded 30 foot travel trailer up a mountain pass at 75 miles an hour vs. gas vehicle at 30mph, with a line of irate traffic choking behind!! But is I get rid of this workhorse what other diesel tow vehicles can carry a family of 9? Anyone? I have nine children. We have the 2004 Chevrolet Suburban with a 4th row (taken from a 3rd row Yukon) added to the cargo area. When I need some cargo space, I just flip down one of the 4th row (50/50 split) which then only gives me 10 seats instead of the 11. That's awesome! How did you anchor that into the floor? Or is it just sitting in the cargo area?